As time goes on the choices in countertops increase. There are so many different ones to choose from. Depending on your style or design you can choose from stone, wood, tile, laminate, concrete and stainless-steel countertops. There are butcher block, quartz and marble. Depending on your budget you can create a beautiful unique design with your choice. But what are the most popular choices today? Listed below are the top choices for your bath or kitchen. 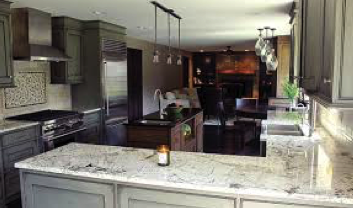 Granite is one of the most popular natural stone materials for countertops. It is extremely heat resistant and is very durable. You won’t have to worry about bacteria or stains with granite. It can even stand up to scratches from a knife. It will need to be sealed to retain its integrity. Granite comes is so many different colors and patterns. It can become very costly depending on which piece you choose. Engineered Stone is another one of the favorites to choose from. It is composed of 93% quartz particles. 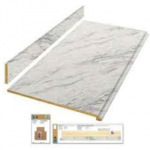 Engineered Stone is extremely durable and comes in a large range of colors. This material does not need to be sealed and because of its nonporous surface is resistant to stains. Engineered stone is on the higher end of the budget. Laminate countertops are one of the most affordable options for your kitchen. They are at the lower end of the budget and are not as durable as granite or quartz. However, they come in a wide variety of colors, patterns, and textures. Laminate countertops can also be made to look like other materials, such as granite or wood. Wood or Butcher Block countertops are beautiful and can add some charm to a kitchen. Maple and oak are the most commonly used hardwoods on countertops. They are available in a wide range of colors and finishes, as well as varying thicknesses. Wood countertops are very porous and can stain easily. You can however re-stain and seal them so are easily fixable. Unlike laminate countertops. They are affordable but can become expensive depending on wood choices.